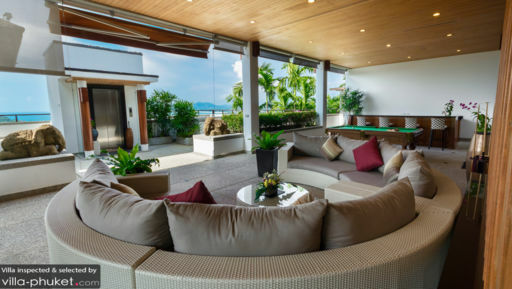 Villa Yang Som is located near Surin beach in Phuket offering views of the Andaman sea at all times and with five bedrooms makes for a perfect tropical retreat to be enjoyed with family and friends. The stunning vista includes the sea, mountains, lush tropical vegetation and absolute tranquility. There are several restaurants and beach clubs as well as shops in the vicinity so that it is easy for guests to head out and explore the island with ease! Villa Yang Som features five bedroom suites that have been furnished to offer the best in comfort to its guests. Where four of the bedrooms have king-sized beds, the last bedroom has four singles which is well-suited for kids. Each bedroom has a private balcony from where you can enjoy the most amazing view and a study for work purposes or anything you wish. Two bedrooms have Jacuzzis outdoors, while the other two have natural stone bathtubs in the en-suite bathrooms. Each of the four bedrooms has its own en-suite bathroom which has been fitted with modern amenities and facilities for your convenience. There are large glass windows around the rooms so you can take in the view and there is ample natural lighting inside. If you have a stunning view lying in front, then all you need to complete the picture is an infinity swimming pool overlooking that same view! 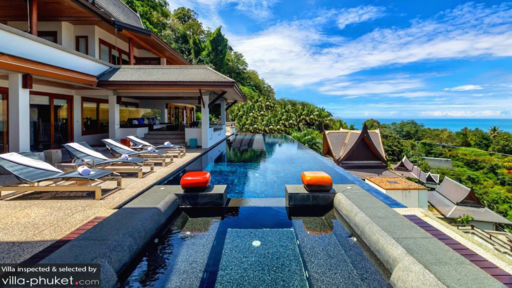 At Villa Yang Som, you have the luxury of lounging in your 18-meter swimming pool all day long and gaze at the sea and the mountains, as you relinquish all your worries and relish the peaceful times. There are sun loungers for relaxation beside the pool, and a traditional sala houses an alfresco dining area. There is another sala that is home to a cozy outdoor sitting area where you can enjoy the sunset with a drink in hand for a fulfilling time. A smooth Jacuzzi tub is also laid outside for guests to lounge in after a swim! Once you’re done with your swim, head indoors to the living area which features an entire which is basically sliding glass doors that gives a spacious layout to the rooms and at the same time adds an enchanting ambiance whence you may ponder at the gorgeous view and relax. There are super comfy couches, armchairs, hardwood floors, and warm homely interiors in the living area. You can relax on the sofas as you watch movies on the massive flat-screen TV or even take a nap. The dining area comprises a ten-seater dining table placed against a spectacular view so that you relish your meals even more. Beside the dining area you will also find the open-concept kitchen which is fully-equipped and ready for use with all its modern amenities and appliances for your convenience. The staff at Villa Yang Son comes highly recommended for their hospitality and kind demeanor in that they will ensure that your stay is memorable and comfortable. The house chef could prepare delicious meals at an extra cost of groceries, if you wish. The villa staff can arrange for chauffeur-driven car, in-house massages, excursions and trips on demand. 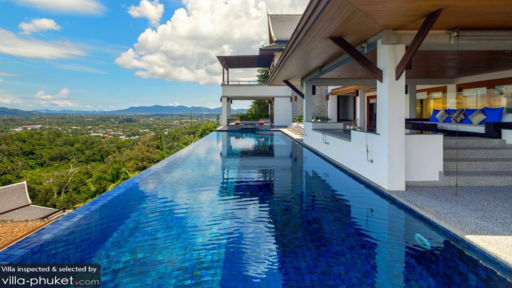 The villa is close to Surin beach, only minutes away from all the restaurants and beach clubs in the area! There is Benny’s American Bar & Grill, Catch beach club, The Bistrot, Taste Bar & Grill and many more. For fun, spend a day at Phuket Adventure Mini Golf playing golf!